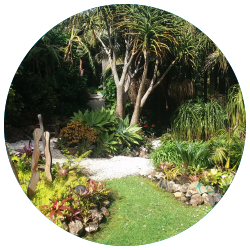 We have a variety of 9 great gardens, plenty of workshops and demonstrations, Ngaio's Plant Sale (Saturday and Sunday 9am to 1pm) and the Sundowner Garden event on Saturday from 4 pm to Sunset. Fullers is running their popular Waiheke Garden Festival bus tour on the Saturday AND Sunday this year. Hei Matau Lodge and gardens have been developed over the last 8 years and the bare rawness of the land and building site is nearly forgotten by now. Additions and improvements to the property and gardens have been going on until recently. Entering the property from Cable Bay Lane, at the highest point of the site, you are welcomed by the stunning view of house and sea, framed by the entrance gates. The plants chosen for this property had to be able to withstand the island clay and lack of drainage, they are hardy but also have great ornamental appeal. The coastal planting and revegetation along the perimeter has become well established and plant species have been used to blend in with the wider natural landscape of the island. Art works have been introduced to enhance the gardens and the architecture of the Lodge. Gates and screens have been designed to be functional and ornamental. Creative concrete treatment of the outdoor fireplace on the terrace has given it a modernistic “fossilised” Iook. A unique windscreen installed around the northern seaside terrace has provided this area with ample shelter from the winds and a fabulous view of the Waitemata and Sky Tower. Kiya Nancarrow’s ‘Following See’ made of corten steel is on display. Artist Danielle Fillion will be painting the seascapes in the garden. Our property is 2.25 hectares with gardens that were well established when we took over in 2015. Just under half the area is planted in Pinot Gris grapes with the house lot in native and tropical plants. A section of the Te Ara Hura walkway bisects the property. The previous 20 years plus life span meant it was time for some serious pruning. Whilst maintaining the original layout, more than 60 large trees were removed and subsequently mulched for garden cover. Selective additional planting has continued with citrus, hebes, and kowhais. The site is nicely situated to afford unique views of the gulf and a big motivation has been to provide an ongoing haven for the islands bird life - we are well visited by fantails, kereru, tui and others. A few sculptures have been added along the way. Enjoy. Street parking only. NO parking in the garden, long drive to meander up. We settled into our piece of paradise on beautiful Hillside Road in 2005, ‘fresh off the boat’ from Christchurch. The garden consisted of 3 Nikau Palms, some tussocks and a bunch of scraggly natives. In the centre of the section stood the most amazing Pohutukawa Tree. With no social network and plenty of time on our hands, we began to garden in a very unplanned way. What was deliberate was the desire to create outside living spaces. Coming from a colder climate we revelled in the ability to “live” all over our section. All has revolved around our one-thousand-year-old tree and what we have today is a lush tropical family garden that has been created from scratch, by us. The Pohutukawa is ever present. The garden is lush and overgrown with tropical plants many taken as cuttings and nurtured to maturity. The garden also boasts an impressive variety of Bromeliads, that have learned to co-exist under the Pohutukawa. Down the path, shaded by low hanging branches, you emerge to a secluded bottom deck, petanque field/family dining table and beyond the line of Griselinias, fruit trees and a set of working vegetable gardens. A garden of surprises, for a family who love to live outside and an example of what can be created with hard work on a modest budget. The roving espresso cart in the garden provided by Lockhart & Smith Event Hire. Neighbours Kim and Gerda will be selling Bromeliads. Cash welcome and eftpos available. Kauri Springs Lodge has an extensive three-acre garden with a distinctive blend of large native and European trees and a tropical ambience. Dense native bush surrounds the property and rising above the Lodge House is a network of paths to wander. The central garden beside the Solarium and Garden Bar—with its hanging baskets of tropical plants—sets off the main entertaining space beautifully. Enjoy views from several vantage points, including views of the garden and across the valley. There’s a large collection of established palms, including Nikau, Majestic, Bismarck, Kentia, King and Dypsis Baronii as well as natives. Palms and ferns create a private setting at the Balinese-style spa pool. A pretty fernery with Silver Lady and Xanadu ferns surround large water urns that boldly stand along the stone paths. Dotted around are clusters of Philodendron and more sub-tropical plants. Entry to this workshop does not require a ticket/wristband. You do need to register to attend, please email iccwaiheke@gmail.com to secure your space. Enter our magically terraced and sunny garden via the art studio and be enchanted. 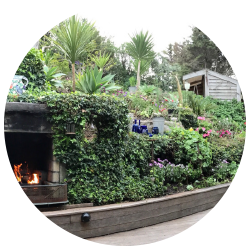 The outdoor log fire nestles at deck level and the hand built pathway leads you through the lavender and rosemary to a delightful sitting area at the very top of the property. We started six years ago with a grassy hillside garden and a handful of established fruit trees and have planted and terraced the sloping section in a whimsical way. Ann will have her art studio open throughout the Festival weekend. The lone Puriri tree attracted me to this property 15 years ago. Planting out the otherwise blank canvas myself, it started as an experiment and it continues. I was no gardener so I applied some basics and took sage advice from my learned friends. I consider my garden a ‘working’ garden and it provides me with a wonderful space to unwind. The care of the Puriri tree remains a priority along with growing plants that attract the birds, butterflies and bees. I also enjoy the practical side of gardening, composting the large amounts of green waste and growing edibles. Make sure to visit Belinda Fabris’ studio across the way from Garden 6 on Seaview Road. Sunday 11 November, 10:00am} This workshop has been cancelled due to a family emergency. Della Glen is in the Garden Festival for the third time, the first in the early days when the garden was in its infancy at around 2 years, the second time was around 5 years later when we considered it at its peak. Now after another 5 years, we are having to replace various shrubs and hedges and shrubs which have had their day. The plantings still include subtropical, native, bog and cottage and we are attempting to give it a bit of a facelift. Hopefully, like us, you will see her as a gracefully aging garden with good bones. This heritage project builds upon the idea of a traditional sanctuary garden in monasteries and convents of medieval Europe. Here the creators found reminders of religious figures in the flowers and herbs growing around them, and from there the idea of the Marian garden grew. The act of planting and tending the sanctuary garden is devotional, and the garden provides a place of quiet contemplation for visitors. Originally created by Jean Sutherland McLeish who commissioned and donated the Celtic cross carved by Paora Toi Te Rangiuaia, the 2018 redesign is a collaboration between Daphne Mitten Landscape Architect and Lara Cheadle Landscape Designer. Since establishing in 2014 Tantalus Estate has been very focused on sustainability and biodiversity. While our grapes receive a lot of loving attention we have also invested time and energy in developing gardens that our bees love and restoring the wetlands to something like they might have been before the invasion of weeds and non-native species. We have planted about 5,000 native plants in the wetlands. We have some beautiful old specimens of Miro, Kahikatea, Puriri, Manoao, Koekoe, Nikau, Kanuka and Manuka. We have added more of most of these species together with Kowhai, Totara and Kauri plus a lot of native grasses. We have built a boardwalk that makes for a pleasant stroll amongst the trees to a quiet sanctuary that is becoming a favourite spot for weddings and parties. We hope you enjoy your visit to our gardens and wetlands. Ngaio Lewis is one of our long time plant growers. She supplies many of our garden owners and is a valued supporter of the Jassy Dean Trust. She and the team will be selling plants from her garden on Seaview Road. 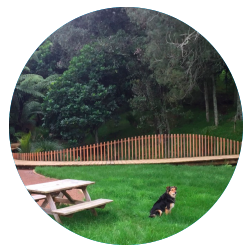 Have a wander through Ngaio’s lovely garden. Thanks to Norlake for sponsoring this event. All proceeds benefit the Jassy Dean Trust. Cash welcome & Eftpos available. A great way to relax after a day in the gardens, watch the sun setting over the Gulf and the City while enjoying a drink and a bite to eat at our Sundowner Garden on Saturday evening. Wander the garden while you enjoy local wines provided by Kennedy Point Vineyard and beer, some lovely gourmet food and tunes while taking in the sunset. 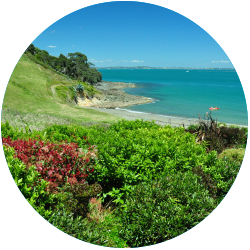 The venue for the 2018 Waiheke Garden Festival ‘Sundowner’ event is the historic Wharetana Bay Homestead. Located on the eastern shoreline of Putiki Bay, the property was settled in the early 1840’s by Belgian immigrants, the De Wittes. Mr. De Witte purchased a parcel of land from Ngati Paoa chief, Wiremu Hoete. The current homestead was built in the 1860s by Lachlan O’Brien, an immigrant from Australia, and later prominent judge in Auckland. O’Brien married Helene De Witte in 1856, taking over the Waiheke property and significantly expanding it. By the early 1960s, the O’Brien family sold the property to a New York family named Rothschild, who were at that time concerned about nuclear war. The Rothschild family divested most of their landholdings over the next fifty years, retaining the original homestead and 10 acres of surrounding land fronting Wharetana Bay. They never lived at Wharetana and the property was purchased by its current owners in 2015. Sundowner Entry is free for Festival ticket holders or $15.00 at the gate. Children under 16 are free. Cash accepted and Eftpos available. Limited parking, carpooling recommended. South American Oven will be onsite selling their Latin delights and Artisan handmade sausages by Babicka’s Table.